Knitted denims refers to knitted fabrics created with indigo dyed yarns to create fabrics which are knits but have a denim character typically due to the dyeing with indigo. The process normally involves converting of dyed indigo yarn beams to cheese form and then converting into knitted fabrics on circular or other type of knitting machines. These fabrics are then used to create different knit products like T-shirts, Jeggings, Shirts, Skirts and other products. 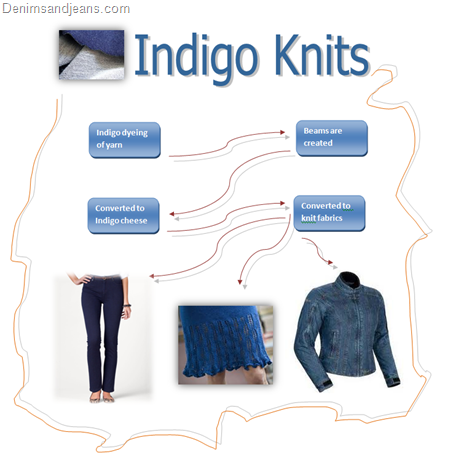 Though the indigo knits have been created for a long time, a huge increase in demand for these products came from the time Jeggings Trend in denim became popular. With the denim fabrics being initially used to create the super tight jeggings, the need for further comfort – while maintaining denim looks – was felt strongly and this is where Indigo knits played a big role. Knitted denim can be combined with other functional fibers like Tencel, bamboo fiber, soybean fiber, spandex and other fibers to create interesting new products. Jeggings trend gave a big filip to indigo knitted denims and China again became the biggest supplier of such fabrics and yarns. A number of mills – small and big – entered the fray and supplied indigo knit fabrics for converting to garments for top brands around the world including Liz Clairborne, Gap, AP, LEVI’S, CK, GUESS, H&M, UNIQLO, ZARA, ONLY , Land’s End, Jockey , Wal Mart and many other retailers and brands . With many of these companies solely devoted to producing indigo yarns and knitted fabrics(indigo), the sizes are volumes are larger than can be found anywhere else in the world. We are listing below 10 large suppliers of Indigo knitted fabrics and yarns from China. Most of them supply to top brands around the world.